John Barritt was editor of the Bermuda Sun during a period of turmoil. Now a barrister and OBA MP, he was just 28 years old when he was handed the reins of the paper. Tensions were rising as Erskine ‘Buck’ Burrows and Larry Tacklyn were to be hanged for the murder of the Governor and rioting would follow. Mr Barritt was recruited from The Royal Gazette, with the promise of being groomed for the Sun’s editorship. Alan Coles held the position at the time. Mr Barritt said: “Alan had a gift. He was a marvelous newspaper person. He designed a column called the ‘Armchair Critic’ which all of us contributed to with our thoughts. It was meant to be witty and entertaining and about what was on TV. Mr Barritt said at the Sun he was able to write under his own byline, which was not the case at the Gazette at that time. Neither would the Gazette allow reporters to quote anonymous sources because, Mr Barritt said, it was the newspaper of record. “As a reporter, I always felt a bit stymied by people who would talk but didn’t want their name put to it — particularly in politics. As his anonymously-sourced stories proved true, the credibility of his reporting increased. 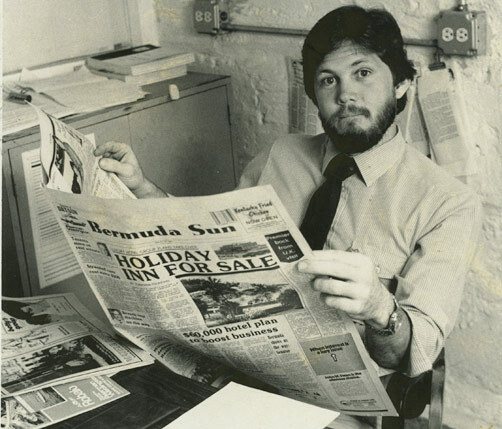 One of Mr Barritt’s first articles predicted the resignation of ET Richards as Premier and it helped establish him as one of the island’s top reporters. He also reported that the founding leader of the UBP, Sir Henry Tucker, had said on the eve of the 1976 election that it would do the UBP some good to lose some seats. Mr Barritt said the contents of the report were read at a meeting at the Princess hotel — there would be no printed copies to get passed around or leaked to the press. Mr Barritt said the camaraderie at the Bermuda Sun was “terrific… Everybody had that spirit we were going to be different, we’re going to be better”. The team would push through on a Friday night to 2am on Saturday to get the paper out. The Sun was located back then on King Street. The camaraderie was put to the test on the worst night of the riots in December, 1977. Mr Barritt said even though the staff was trapped in the building because of the riots and curfew, there was never any doubt that they were going to get a paper out. “A lot of us were worried about our families. My wife was at home with a young child, but we couldn’t go because police wouldn’t let us go. “We had to stay in the building all night and no one slept. We heard all this noise and wondered what was going on. We were without communication — there were no cellphones back in that day and no Internet. “The fact that we were reporters and newspaper people — even the printers downstairs — understood this is what newspapers do. They report the news and try to be first with it. We were bitten by that bug and we were trying to be professionals about it.